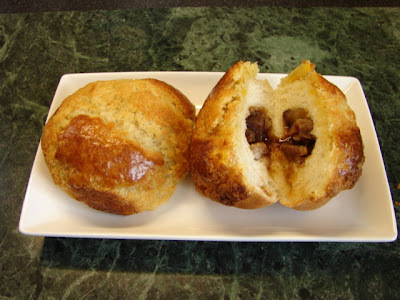 Sunflower Food Galore: Baked char siu bun with pineapple topping. I have not made Chinese buns for a while now. Since I have some char siu sitting in the fridge I thought of making some char siu buns. I love the sweet crunchy topping on some of the buns in the chinese bakery called 'bo lo bau' or bun with a pineapple shape topping, though many have no added pineapple at all just the shape of the topping scored in diamond like this . I found this recipe with actual pineapple added and with my own adjustments, here it is. Mix the bread dry ingredients together. Add milk and melted butter. Mix then knead for about 5 - 8 minutes. Leave to rise for 45 – 1 hour. Finely diced the char siu. Add to a small pan with the rest of the ingredients. Heat till thicken. Leave aside to cool. To make the topping, add flour, milk powder, sugar, bicarb together, stir then add butter and lard. Mix to a breadcrumb texture. Gently stir in the egg yolk and minced/crushed pineapple. Spead some flour on the working area, pat the dough together with some dusting of flour. Cut into two equal pieces. Roll each piece into a long sausage. Cut into 10 pieces and roll each into a ball (if too sticky coat hand with flour). Repeat with the other piece, till you get 20 pieces of dough balls. See picture. Cover with cloth. Once the bread dough has risen to twice its original size. Dust the working area with flour. Tip the dough on to the working area. Give it a quick knead. Divide into two equal piece, then stretch it out and cut into 10 pieces (about 45g each). Coat palms with a little flour, press and roll each piece into a ball. Repeat the same with the other piece dough, till you get 20 equal pieces of dough balls. Cover with cloth. Tease and stretch each dough out (like in picture) and fill with about 1 tbsp of filling. Grap the end together and form a ball. Put sealed side down on non stick (or patchment paper lined) tray, with enough space for the bun to rise. Repeat till you have finished making 20 buns. Cover and leave to rise for about 30 - 45 minutes till the buns have risen. On a clean working area, dust hand with flour, take a piece of topping ball and press or pinch with fingers till it forms a disc about 6cm diameter. Put this disc on a bun like a blanket. Continue doing this till you have covered the 20 buns with a topping. Brush each topping with beaten egg yolk. Baked at 210 - 220 deg C (fan oven) for 9 – 10 minutes till golden brown. The buns were a success. It was really tasty too. I was so greedy I stuffed my face silly with 4 within 2 hours, washing down with a nice cup of tea. Definitely will make again. So pleased to have found your blog today! I look forward to trying quite a few of your recipes - especially as being in the UK too (Hertfordshire - about 30 miles south of you,) your experiences will be within the same humidity and difficulty in sourcing ingredients! Have you tried chinese read recipes that use tangzhoung starter (65 deg c water-roux paste)? The idea is that the partially cooked flour and water gelatinises and when used to make bread dough the result is a moist, soft, fluffy texture that keeps well. I tried a Cocktail bun recipe at christmas at my Mum's and OHMIGOD! It was delicious! My bro like Bo Lo Bao, so your topping as posted here can be used for that with the sweet-bun dough recipe I have. Water roux is good for all soft baked buns. As for keeping, IMHO ok for up to 1 1/2 days after that they become dry like any other homemade buns, you'll need artificial bread improver to keep buns soft for days.